All Yangtze River cruise ships of high standard provide very good services to perfect your new experience of the Yangtze cruise tour in China, from the boarding, dining, drinking, accommodating, to entertaining, requiring, guiding, relaxing, and disembarking, etc. With nearly every two staff service for every three traveller guests onboard, every one of you will get real relaxed and well satisfied with the great efforts offered by the professional staff during your holiday on the river cruise ship. It’s really nice of the cruise companies to provide a lot of included onboard services for every guest onboard for free charge, which enables you to have a comfortable and happy cruise trip very easily without any extra payment. What you need to do is just to get relaxed and enjoy these services. During the embarkation hours, the attendants of your cruise company are waiting at the boarding point to welcome your visit with great enthusiasm and help you to board safely and comfortably. Your cruise of good services starts with their warm smiles and words. Also, on your way to and back from the excursion sites, attendants also stand there in order to show you the way and also kindly remind you to watch out steps with sweet smiles, which gives you a good mood along the way. Luggage services are offered to carry the baggage to the room, so you can board the ship effortlessly. The front desk usually is arranged at the main hall on the second floor of the cruise ship, and you can easily find it after your boarding. Staff here provides you good 24-hour services, like inquiry, food ordering, cashing, exchanging, waking-up, depositing, luggage conveying, optional shore excursion applying, and so forth. In all guest rooms onboard, good central air conditioner, broadcasting system and other great facilities and amenities of high quality are equipped, so you can use them according to your needs. Besides, every day, the room attendants will clean your room, supply bottled drinkable water, and make the beds to make your stay onboard as comfortable as possible. Considerate guide services are also provided for all guests. The cruise guide speaking both English and Chinese will answer your questions sincerely, and also, he/she will hold a meeting for you to know about the cruise trip before the ship starts sailing. He/she will inform every guest about the attractions and activities of the next day through the broadcasting, bullet board and the television, so you would easily know what you would do through your trip. Moreover, the guide will join in to hold the night shows, activities, lectures and the introductions of the Three Gorges for you to totally enjoy the trip. A lot kinds of delicious Chinese and Western cuisines are offered in the three meals (usually buffet for breakfast and lunch, Chinese banquet for dinner) for each guest every day, and also, there are coffee, tea, juice, cola, sprite, water, bear, and other drinks provided with limited amount to go with the food. The staff at your table will provide you favorable services based on your needs during your dining time. To keep your lifestyle go on and enrich your life onboard, there are many high standard facilities arranged in the public area, such as the fitness center, reading room, sun deck, and so on. To let you have more wonderful moments along the Yangtze River, three to four shore excursion sites, including the Three Gorges Dam Site, are arranged by the cruise company for free for guests to visit the attractions through the tour. Your relaxing trip will be full with culture, history and meaning. To enrich your experience on the cruise, multiple activities, lectures and entertainments are prepared by the reputable cruise company, so you can learn and enjoy the Chinese culture and history, Chinese medicine, Chinese costumes, singing and dancing performance, fire-spitting, opera show, kite flying on the sun deck, and so forth. You would spend every moment happy and memorable. Many services for fee but with especially high quality and good praise are prepared by the managers and cruise crews on all Yangtze River cruise ships, which is in order to benefit your needs as in your daily life and upgrade your experience of the river cruise trip to the most. If you need the services at below, just tell the staff and give the payment, and then they will arrange them well for you. Some optional shore excursion sites are arranged by the cruise companies for guests to know more and better about the Yangtze and China. If you want to enjoy the more primitive landscape, interesting culture and long history, authentic local folk customs, you can tell the reception desk and give the payment. You can know the detail fee of each site from our travel consultant or cruise staff at the reception desk after embarkation. Usually, some Yangtze River cruise ship offer 1 to 2 swimming pools for you to have some fun time, with one kind being the ordinary outdoor swimming pool and another the indoor thermostatic constant temperature type. No matter you want to swim in the outdoor pool to get closer to the primitive natural view of Yangtze, or to do in the indoor one to enjoy harmonious time with friends and family, you can both get great enjoyment and nice experience. Charge reasonably. If you want to share some beautiful pictures, sending emails or electronic greeting cards, or deal with some business, you can tell the reception desk to use the Wi-Fi service or the computer linked with the Internet. This service needs extra pay. Yangtze River cruise ships prepare a series of souvenir shops for every guest to choose their favorite items for their family and friends. You will have a lot of choices, like clothes, dolls, post cards, jewelries, books and magazine, food and beverages, and so on. You can know the detail price of each item from the staff after boarding the ship. Considering about your body relaxing during the trip, the Yangtze River cruise companies also prepare some services of the Spa, massage, sauna, and foot massage, and so forth. You can enjoy the services to stretch your body and release the pressure with your friends or with some personal moments. Charge reasonably. To make always look glamorous and energetic as usual during the cruise tour, the Yangtze River cruise ships arrange the beauty & hair salon usually at the lower decks to offer services of skin care, hair washing, styling, cutting, perming, dying, and so on. You can ask the front deck or staff at the salon for detail prices. On Yangtze River cruises, there are usually 1 to 2 bars and cafés decorated and equipped excellently for the drinking enjoyment of traveller guests onboard. Providing a lot of choices of beverages, such as red wines, whiskey, vodkas, champagnes, beers, coffees, and other alcohol-free drinks, the bar and café serve well to meet the demands of all guests. Detailed prices to be known from the staff at the bar and café. If you would like to have meal in your room or enjoy a night snack onboard the ship, you can order some dishes and drinks you like by calling the staff at the front desk. The chef will prepare with high efficiency and quality, and the crew will deliver your delicious food to your room with great service. Need extra charges. Onboard the Yangtze River cruise, there is 1 to 2 professional doctors at the clinic to provide medical services of traditional Chinese and Western treatment. So any guest feeling uncomfortable during the cruise can go to have treatment. The service needs to pay extra. 1. Since staff on the cruise can speak good English, you needn’t worry about the communication with them. If you have any questions or any needs, just tell the staff, the manager or the cruise guide, and even our Travel Consultant. 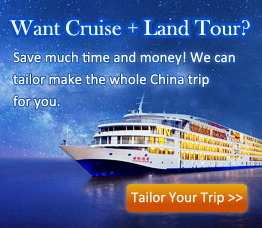 We all would try our best to meet your demands to give you a worthy Yangtze River cruise trip in China. 2. Please note: to know the detail chargeable services and prices of our ideal Yangtze River cruise ship, please contact our professional Travel Consultant for help, or inquire the staff at the front desk after your embarkation.